Ocean Spray is bringing a cranberry harvest to a headset near you. 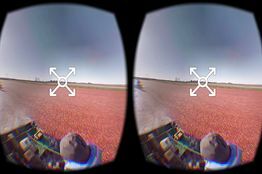 The 85-year-old cranberry cooperative this month is rolling out its first campaign usingFacebook FB +0.73%’s Oculus Rift virtual technology with a five-minute film documenting the flooding of a cranberry bog for the fall harvest. The short film, titled “The Most Beautiful Harvest,” was shot using a custom camera rig outfitted with six GoPro cameras as well as aerial drones and narrative clip cameras. At various points during the film, viewers wearing the Oculus Rift headset can turn their heads in all directions to view expanses of red berries in the flooded bog and watch as the berries are loosened from the vine by so-called egg-beater machines, brought to the water’s surface and eventually corralled and shipped. The film, shot during last year’s harvest on a farm in British Columbia, has a narrator to explain every step of the growing process. 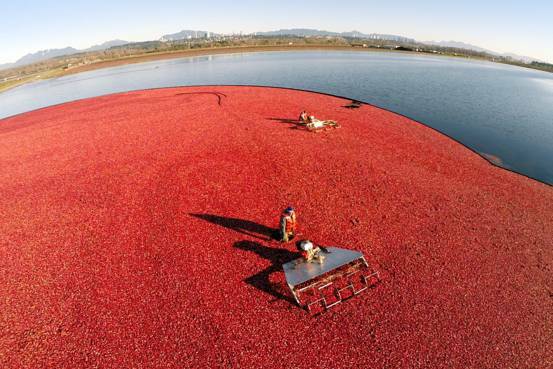 For Ocean Spray, which for 11 years has organized a “bogs across America” tour to promote its cranberry products, the Oculus Rift campaign allows the brand to “share the beauty of the harvest” to consumers who have never seen a cranberry bog in real life, said Chief Marketing Officer Paul Stajduhar. In markets such as Asia and Latin America, where Ocean Spray doesn’t advertise heavily, the virtual reality experience aims to better educate consumers on the brand and cranberries. “The technology allows us to bring this harvest very far,” Mr. Stajduhar said. The cooperative will preview the virtual reality experience to 250 influencers in 10 cities around the world later this month, providing two to 15 Oculus Rift headsets to guests at each city’s event. The film’s first screening will be held on Sept. 9 in Shanghai. Consumers, meanwhile, will be able to view the film using Google Cardboard, a low-tech virtual reality viewer, next year. A version of “The Most Beautiful Harvest” with 360-degree views will also be available on Ocean Spray’s website. Ocean Spray is one of many marketers experimenting with Oculus Rift and similar virtual reality technologies to build more immersive and engaging experiences for consumers. Still, virtual reality hasn’t yet gone mainstream and the platform provides added complexity in how marketers shoot and tell stories. Such campaigns have the most impact when”you really have an environment that can pop” with virtual reality technologies, said Chris Perry, chief digital officer of Weber Shandwick, the Interpublic-owned agency behind Ocean Spray’s virtual reality campaign. The cranberry bog, for example, provides strikingly visual elements for a virtual reality experience because of its bright red berries and vast size. “There are certain opportunities that really lend themselves to what this platform can provide,” Mr. Perry said. Ocean Spray said the production costs for the virtual reality film are on par with what it spends to produce a traditional ad campaign in the U.S. The cooperative spent roughly $21 million on measured media in 2014 in the U.S., according to data from WPP’s Kantar Media, which tracks ad spending. Ocean Spray had gross sales of more than $2 billion for fiscal 2014.